Candidate must be at least 2nd year college level of any degree courses; With at least six months of accounting experience; Must be proficient with MS Office suite; Must be organized, patient, trustworthy and attentive to details. Candidate must be at least college level; With training and/or experience in Nihongo translation and interpretation; Must be knowledgeable of Katakana, Hiragana and Kanji; At least with Japanese Language Proficiency Test level 3; Must be proficient in MS Excel, MS Word and Adobe PDF. Candidate must be a graduate of BS in Industrial Engineering; Preferably with training in process improvement, kaizen and project management; Has high attention to details. Female; Must be a graduate of BS in Electronic and Communications Engineering; Preferably with experience in new product set up and other engineering tasks in an electronics manufacturing company; Must be computer literate; Has good verbal and written communication skills. Candidate must possess at least a relevant vocational diploma, or at least college level of any courses related to CAD operation; Preferably with at least 1 year experience in similar/related job in a manufacturing company; With knowledge in jig fabrication; Has competent skills in MS Word & Excel, as well as CAD applications including Solid Works, Solid Edge, Autodesk Inventor, etc. Female; Graduate of any 4 to 5-year courses; With at least 1 year experience, preferably in purchasing or logistic tasks; Has competent skills in MS Office; Must be fluent in English language, both spoken and written; Must be flexible, attentive to details and adept in organizing activities to ensure effective results. Candidate must be a graduate of BS in Accountancy; Must be knowledgeable of the Philippine accounting standards and BIR regulations; Has competent skills in MS Office programs; Can work under pressure. DBA PHILS. GLOBAL SHARED SERVICES, INC. Candidate must be a graduate of BS in Accountancy or other relevant business courses; A master’s degree holder or CPA designation is an advantage; With experience in accounting/ financial reporting/ tax/ IFRS areas in a supervisory position is a plus; With experience from Big 4 firms or similar international accounting firms will be highly regarded; Must be PC proficient and preferably with experience in large automated accounting systems including cloud accounting system; With strong background in MS Excel and Word; Has strong interpersonal, supervisory, customer service, and verbal & written communication skills; Can handle multiple tasks, meet deadlines and be able to thrive in a fast-paced work environment; Can work under pressure. Male/Female, 25 to 35 years old; Must be a Certified Public Accountant; With at least 1 year of relevant work experience; With relevant trainings/seminars; Must be proficient in verbal and written English communication; Must possess a valid driver’s license; Must be computer literate; With good moral character. 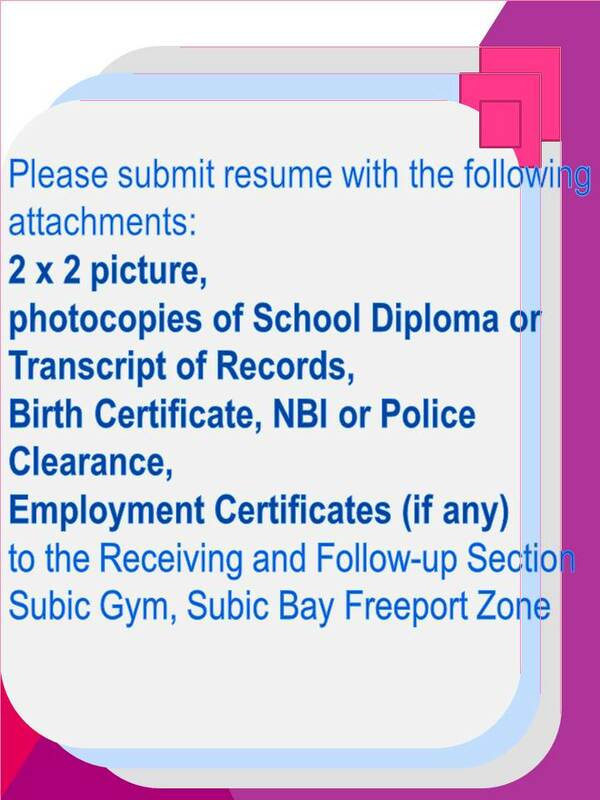 Documents required: a] Letter of intent; b] Comprehensive resume with picture indicating education and work experience with inclusive dates; c] Proof of work experience/s; d] Photocopy of school TOR/diploma; and e] NBI/Police clearance. Female, 19 to 25 years old; At least 5’3” in height; Graduate of BS in Tourism/ Hotel & Restaurant Management or other business courses; Preferably with relevant work experience; Has good PR and selling skills; Has excellent English communication skills; With knowledge in Chinese/ Korean/ Taiwanese or Japanese language is an advantage, but not necessary; Must possess a very pleasing personality with an honest and trustworthy attitude; Must be physically fit; Must be willing to work on shifting schedule. Male, 25 to 33 years old; At least college level; With at least 1 to 2 years of experience in Korean or Western and international cuisine; Has average English communication skills; With knowledge of laws and regulations governing food preparation in institutions; Can understand and practice safety procedures and precautions; Must be physically fit; Can work under limited supervision. Female, 20 to 26 years old; At least college level/graduate of BS in Hotel and Restaurant Management or with vocational diploma relevant to Hotel and Restaurant Operations; With at least 6 months to 1 year of working experience in hotel industry; Has excellent English communication skills; Has good PR and selling skills; With pleasing personality; Must be honest and trustworthy; Must be capable of handling multiple tasks; Can work well under pressure in a fast-paced environment. Female; Graduate of any 4-year courses, preferably of BS in Management, or at least with vocational diploma; With or without experience; Must be computer literate; Willing to train and be trained; Must be willing to render overtime work; Can handle work pressures and multiple tasks; Ready to undergo medical exam if required. SEUNG LEE MERCHANDISING AND TRADING, INC. Candidate must be at least college level; With creative skills in graphic arts; At least with enough knowledge on color harmony theory; Must be knowledgeable in photoshop; Must have the ability to source out graphic arts and artistic fonts on the web; With proof of previous projects or own collection of artwork; Must be a team player; Must be willing to work during holidays; Can work under pressure. Male/Female, not more than 40 years old; Graduate of BS in Hotel & Restaurant Management/ Food and Nutrition or other business courses; With at least 1 year of managerial experience gained from a local restaurant or fast food chain; Has good leadership skills; Must be customer service-oriented. Female, 18 to 25 years old; At least 5’2” in height; With pleasing personality; Has excellent communication skills; Must be customer service-oriented. Male, 20 to 30 years old; At least 5’5” in height; Graduate of any courses relevant to Food Service; With at least six (6) months of experience in any food establishments. Male, 30 to 40 years old; At least college level; With at least 2 years of relevant work experience; With working knowledge on various warehouse management and inventory procedures, especially vehicle parts; Must be computer literate. Male, 25 to 40 years old; At least college level; With at least 2 years of experience as a Transport/Vessel Dispatcher in a bus/shipping company, or other experience related to manpower handling; Has competent skills with MS Word and Excel; Must possess a valid driver’s license, with restriction code nos. 1, 2 & 3; Must be willing to be trained and assigned in any field work; Willing to render overtime work. Male, not more than 35 years old; At least 5’5” in height; Must possess at least a high school diploma; With at least 1 year experience in delivery van driving. Candidate must be 20 to 25 years old; At least college level; Has strong time management skills; Can work independently and as part of a team; Can work accurately with interruption; Must be flexible, with initiative and willing to learn; Must have the ability to exercise good judgment and discretion; Has excellent customer service and problem-solving skills; Must be willing to work on variable schedules including weekends; Can work under limited supervision. Male/Female, not more than 35 years old; With at least 3 years of experience in guest service role and strong knowledge in surrounding areas; With nigh audit experience and accounting background is an asset; Has excellent communication, guest service, time-management and computer skills; Must have exceptional interpersonal skills to enhance the service standards throughout the operation; Must be detail-oriented, a team player and self-starter; Able to work independently and effectively in an innovative, fast-paced and multi-tasked environment; Must be able to organize, plan ahead and manage workload. Male/Female, not more than 35 years old; With at least 1 year experience in the field, preferably in a hotel industry; With knowledge in using kitchen equipment; With good moral character; Must be trainable, flexible and physically fit; Must be willing to learn for advancement; Can work on a shifting schedule. Male/Female, 21 to 27 years old; At least 5’4” in height; With relevant work experience; Can communicate in English language; With pleasing personality; Able to work on shifting schedules; Must be capable of handling work pressures. Male, 21 to 26 years old; At least 5’7” in height; With pleasing personality and smart personal appearance; With driving skills; Can communicate in English language; Able to work on rotating shifts, including night shift; Must possess a positive attitude; Can work independently; Must be customer-oriented and a team player; Must be physically fit. Male/Female, 23 to 30 years old; At least 5’6” in height for male and 5’2” for female; With at least 2 years of relevant work experience; With good moral character; Can communicate well; Able to work on shifting schedules; Capable of handling work pressures. Male, 18 to 25 years old; With pleasing personality; Graduate of any 2-year vocational courses, or at least college level; Must be of good moral character. Male, 18 to 25 years old; At least high school graduate; Must possess a valid driver’s license; Must be familiar with the area of Olongapo City and the Subic Bay Freeport Zone; Must be honest and trustworthy. Male/Female; Must be a holder of at least a bachelor’s degree; With pleasing and an outgoing personality; Has good communication and interpersonal skills; Must be willing to work on rotating shifts and holidays. Male, 18 to 20 years old; At least college level; With pleasing personality; Must be of good moral character; Has good command of the English language, both spoken and written; Must be willing to work on rotating shifts including weekends. Female, 18 to 20 years old; At least college level; With pleasing personality; Must be of good moral character; Has good command of the English language, both spoken and written; Must be willing to work on rotating shifts including weekends.